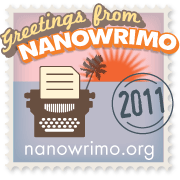 So, how has the first week of NaNoWriMo (or, in my case, KazNo) gone for you? Personally, I had a shaky start… I failed quite spectacularly for the first few days of the challenge and wrote absolutely nothing. I’ve started now, though, and thanks to a reasonably quiet weekend and an understanding husband who took the kids to the fireworks, I now have 4,800 words. I’m feeling pretty wiped out today, but I’m hoping to get to 5000 before bedtime. Then I’ll only be 2000 words behind. Ho hum. That is brilliant progress, Alistair – well done! Are you pleased with your outline and character stuff? Good luck for the rest of the week. I’m cheering you on! Aw thanks! Pleased with the outline; Boarding school full of strange artifacts, rifts in the multiverse, knights, werewolves and aliens. The character stuff is really interesting, except you don’t know where to stop, even though you know it’ll change as you go along. Seems to help having them formed in your head as you make things up. I like the sound of your book… You have to finish it now, so that I can read it! I have never written a character study in my life although I wish I could. My ‘method’ – spending thousands and thousands of words of rough draft (AKA dross) getting to know them – isn’t very efficient!